In Honduras, gasoline costs 52 cents a gallon. And roads are wicked. And people aren’t rich. 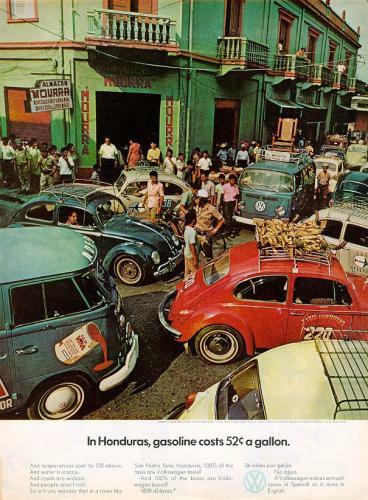 … A Volkswagen makes as much sense in Spanish as it does in English. Can anyone put a date on this ad? Seems like the times haven’t changed that much. I would slaughter a football field full of babies for 52 cents a gallon. I think in the Honduras, you can do BOTH of those things…. I’m gonna say 60s or 70s. But if it wasn’t for the gas price, I could say Tuesday. @ natedog: In the 1930’s many cars were running on corn alcohol. Read www.runet.edu/~wkovarik/ethylwar/ and own.